First, it seems to be important for the candidate to be presentable. I did not know at the time; however, appearance is very important in the Thai culture from my observations. Luckily, I was well dressed and groomed for my interview at the beginning of my journey. I am convinced that this played a big part in acquiring the position. Therefore, dress for success. Second, the class has to be enjoyable for the student(s). From my observation, the students were truly the boss. The slightest complaint or boredom would lead to the replacement of the teacher. I noticed teachers getting replaced quickly and often; therefore, I learned that an engaging and enjoyable class was essential. A lesson plan with multiple back up activities is highly suggested. Most language teaching schools follow books and some have their own teaching methodology that has to be followed; however, sometimes things don’t work in the classroom and having the skills to adapt a lesson is key for success! The TESOL Diploma program offered by OnTESOL provides the most comprehensive training. Finally, how well an individual wants to live depends on the number of hours they teach. However, the more one works, the less of a social life, or just life, one will have, and I have seen teachers work seven days a week to live a middle class lifestyle that matched back in Canada. I was one of them for years. The wages here in Thailand are low and by the hour – no hours, no income. Work can be seasonal too. Therefore, it is up to the individual to strike the necessary balance. 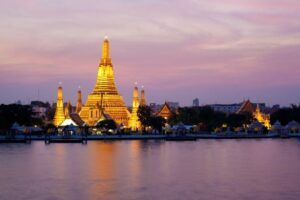 In short, consider presentation, enjoyability, methodology, and hours if you choose Thailand. Best of luck and enjoy the experience.